This is the first study I have come across that locates TS structures as part of a "high-throughput" single-site catalyst design study. Furthermore, the catalyst contains iron, which is not the easiest of elements to work with computationally. The study locates 76 and 43 TSs for the oxo formation (TS1) and hydrogen atom transfer (HAT, TS2) steps of the catalytic cycle. These are relatively small numbers compared to high throughput studies of other properties (hence the quotation marks), but they are roughly an order of magnitude larger than the number of TSs found in typical computational study of catalysts. The number is smaller for HAT due to difficulties in locating TSs for this step. The TSs were located using either NEB implemented in DL-FIND or Q-CHEM where initial guess structures were generated using a locally modified version of molSimplify. The studies show that there is a good correlation between reaction energy and barrier for the HAT step (R2 = 0.99) but a poor correlation for the oxo formation (R2 = 0.50 - 0.81). 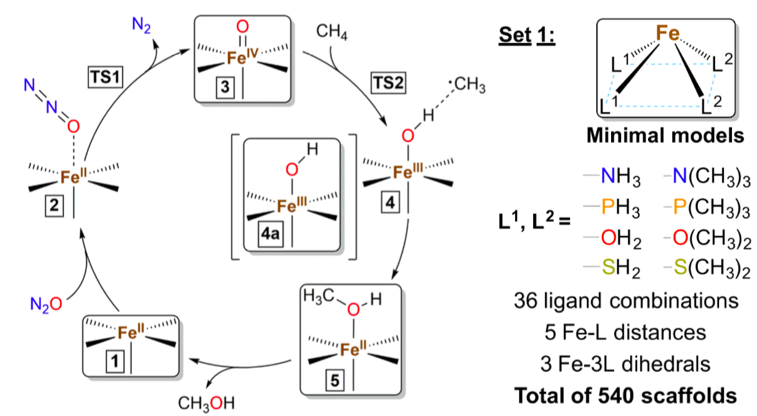 The authors conclude "Overall, our work shows that LFERs can be leveraged in single-site catalyst screening only when the coordination geometry is held fixed. Reliance solely on LFERs for single-site catalysis will thus miss rich areas of chemical space accessible through scaffold distortion."